This is an event that many of you might find interesting. We have reposted this due to the interest shown. If you are interested please contact the organisers directly. With tyres, brakes and engines still warm from Liege-Brescia-Liege 2018, it's already time to look ahead to next July when it's the turn of Triumph TRs to drive the amazing, original 1958 route from Belgium to the Dolomites, to Ljubljana in Slovenia, back to the Dolomites taking in its finest passes like Pordoi, Stelvio and Gavia to Brescia, then back over Gavia and Stelvio the opposite way, and over the delightful Passo Pennes, back through Austria and Germany to Belgium again. 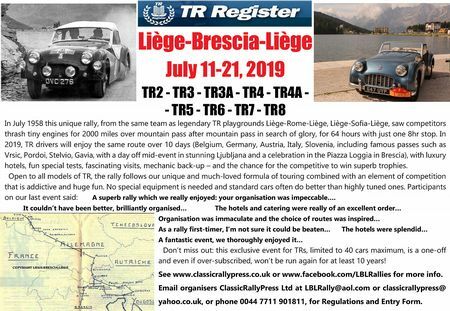 Stunning scenery, wonderful driving roads, fascinating museums and castles, great hotels - the TR Register Liège-Brescia-Liège 2019 beckons! If you're already on the entry list, we look forward to seeing you in Liege next year - if you're not, we look forward to hearing from you very soon!